It's a beautiful night outside here on Wilmington Island, with the Atlantic Ocean about two miles due east and Savannah eleven miles inland. Such a calm belies the hustle and bustle in which most coastal residents find themselves. 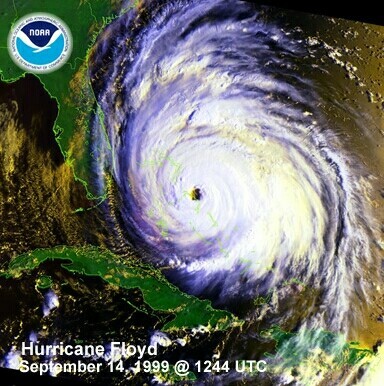 A menacing and growing hurricane named Floyd is driving the north edge of the Caribbean. My wife Melissa has driven back into work (Kelly Services) at 9:30 this evening to try to close up shop as much as possible allowing a further degree of usefulness for a few hours of work tomorrow morning. My younger brother Bill who is visiting is presently (10:38 pm) out for a walk around the neighborhood. The sky is clear and black with stars, the air is breezy but not too warm. I'm straightening things up around here, doing last minute laundry, taking loose items out of the yard. Bill had earlier called as many motels as he could from here to Atlanta and beyond with no luck, telephone lines being busy or no rooms available. He did find something in Alabama just across the state line from Columbia, Georgia. I'm hoping we don't have to drive clear across the state use it. I am thinking I won't go into work tomorrow; with mandatory evacuations occurring tomorrow morning, things at Gulfstream Aerospace will probably turn towards letting most employees leave before noon. But by then it would be impossible to get back home fighting the evacuation traffic, meaning we'd definitely have to find a place inland to hole up. My money and prayers are on the hurricane staying way to the south. Right now it's on an easterly course putting landfall around southern Florida, unfortunately, where a great many people will be impacted. I'm thinking that if I stay at home things will not be as bad weather-wise and we'll at least have the comfort of our own surroundings. Melissa is for getting out of Dodge. In a way I can agree, but my hope is detaining me. I am getting things prepared, gathering important papers, etc. just in case Floyd does move north. 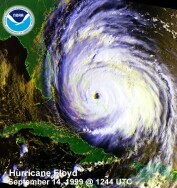 If you had been watching the Weather Channel you would have a good idea of what Floyd is up to. But it gives no clue to the fear it strikes in the heart of those seriously contemplating facing its fury. Last year when a hurricane past us by and instead struck Myrtle Beach, we had a pretty good idea that we would lie outside its path. Today, the certainty is much less clear and that ambiguity is quite unsettling, added to which is the decision making process, gathering of facts and opinions of which direction to turn, to stay or go. It is an ugly feeling. I hope tomorrow morning reveals a more clear projection. At that time we make the final decision. Bill feels he'd like to try riding it out with me/us, while also wanting to drive away quickly. We'll see tomorrow. Funny, while residing so much farther away from the coast in Ann Arbor, Michigan I had no notion that such a relatively common occurrence was a way of life as it is here. Now that we live on the coast ninety-eight percent of the time things are grand, skies are sunny, life is carefree. But that two percent can be awesome. We'll see how it goes. Tuesday dawned as clear and sunny as most days in this coastal empire. The local news was reporting that Floyd was coming calling and recommended a full evacuation of Savannah and all of Chatham County. So, after leaving the house at noon under this mandatory evacuation, we hit the road, that is Melissa and I and our cat Sasha in one car and Bill in his. The drive inland toward Savannah first appeared like any other, unfettered, taking the usual 15 minutes to reach the downtown area and the turn from Bay Street onto Martin Luther King Blvd with the entrance to Interstate 16 about one half mile away. It was when we made the turn that our plans came to a sudden and literal halt. And we joined the throng in what turned out to be a 90 mile Interstate parking lot. But at the time all we saw was a road full of non-moving cars all pointing in the direction of the freeway. We didn't know if there was an accident up there, our imaginations ran wild. Car engines were turned off and occupants crawled out craning necks trying to see anything that would divulge a clue to the cause of this auto line up. Every few minutes we would creep forward a few inches, stop, wait, turn off the engine to save gas, and wait some more. After some time the car in front would moved almost imperceptibly and, domino-like, everyone behind would then similarly advance. Bill hates to stand still and wait so he left his car to walk as far ahead as he could and I offered to accompany his vehicle to inch it forward at the proper time. He came back with no satisfactory answer to explain this motionless sea of automobiles. But time was moving forward even if our cars were not. It must have taken about an hour to travel, inch by inch, to the entrance of the expressway. This is where I-16 has its easterly terminus. Along the way we expected to see the cause for this logjam, but were disappointed at every motion. The inch by inch momentum continued after we reached the freeway and continued for the next 90 miles! It was the single most bizarre public act I have ever witnessed, an entire county of inhabitants had descended upon its roadways seeking any shelter the deep inland could offer. And it seemed that all of them chose I-16 just like we did. The tedium of such travel would directly translate in the telling of this tale but unlike the impediment we endured I will relent. Suffice it to say we saw a wealth of fascinating sights that only this kind of event could stage. Cars overheated and broke down at the side of the road. Emergency vehicles would attempt to negotiate the shoulder of the highway to administer aid. I had such concerns about our own vehicle dying, but we were spared any mechanical difficulty and Melissa's black 1999 Ford Contour performed admirably, even with the air conditioner running constantly. We witnessed drivers crossing the median of the freeway deciding to drive west while on the clear eastbound lanes. This eventually became a legal choice as after a few miles the County Sheriff blocked eastbound traffic for exclusive use of evacuation traffic. As the day wore on still under a hot and full sun rarely hidden by clouds travelers would remain so long in their cars locked on this road they would actually get out of their vehicles during the plenty of times the cars were in full stop and relieve themselves as privately as they could in broad daylight. Some would walk the 30 yards distance to the woods or brush along the road's right of way for more privacy, others merely leaned against their cars. This was not a pretty sight. After creeping forward mile after mile we kept hoping, praying, the traffic would break free and open up so we could drive 20 mph, or 30 mph or any decent speed other than the snail's pace we were experiencing. But the day kept dragging on along with the ribbon of vehicles. It took us 12 hours to travel 90 miles! Yes, that's about 8 miles an hour average including a great deal of time in the stopped position. After an hour or so of waiting to get onto the freeway Bill chose to strike out on his own. He really hates to sit and do nothing. We initially caravaned together but he got off the freeway even before leaving the Savannah city limits while Melissa and I chose to maintain our heading with great, though unwarranted hope. He was heading for a Best Western in Alabama, the same latitude as Atlanta. Our destination was north of Atlanta near the Tennessee line. I hesitated to exchange one set of bad projections for another, so we continued on I-16, creeping bumper to bumper, much of the time at a standstill, while a million other people joined us in evacuating the coast. When nightfall came some 8 hours later we were still stop and go in a snake-like train of vehicles stretching to the horizon. During our 12-hour crawl we dared not get off the road for toilet breaks because it would take additional hours in jam-packed intersections and gas stations. And we modestly refused the alternative so many creatively chose. We did eventually have to make such a move and at the town of Metter, around nightfall, 8 o'clock or so, and we joined more throngs of evacuees at an overcrowded highway exit containing the usual fast-food restaurants and few gas stations. We spent 45 minutes just getting off the freeway and using a restroom and a phone to verify that our motel would hold our room even if we didn't get in until daylight Wednesday! Our time on the road then was already 10 hours old. It nearly exhausted our patience just trying to get out of this "rest" stop area, going in circles, cars trying to move in any and all directions trying to park or trying to leave. But we did finally get back on the freeway and back into queue, slowly, ever so slowly moving forward. By midnight we were about 6 tenths of the way between Savannah and Macon, and finally open road greeted us, the freeway releasing it's concrete grip. I repeat, that's 12 hours to travel 90 miles! And we were still 5 hours from our destination. After what seemed like centuries, physically and emotionally exhausted we pulled in to the motel at 5 am Wednesday, unloaded the car and only then collapsing into bed around 6 am. The motel was just outside the Chicamauga National Battlefield, a popular vacation spot. But this was not a vacation by any stretch of the imagination! Wednesday was spent mainly recuperating from a sleep-deprived state. Only very late in the afternoon did we get out of bed, to face still a very sunny and beautiful day. The hurricane had not flung its storm clouds this far west and there was not a hint of it to be seen. We also declined to take advantage of being so close to the rich heritage offered by the so-close national battlefield, which I had visited some decades earlier. Even the motel's pool saw little action, though I did make use of it to lay prone and still in its relaxing waters. But I still would not use the term "vacation." What we mostly did was remain in our room sleeping or trying to gather news of home from the TV's Weather Channel. We heard nothing of what was going on in Savannah, so we had no clue how things were fairing or when we could go back home. It is over and we find it amazing! God provided a most unexpected miracle and left untouched our home and neighborhood. We arrived back at our house at 9:30 this morning after leaving the Best Western in Fort Oglethorpe so close to Chattanooga, TN. We got up at 2 am and left there at 3 expecting pretty much the same horrendous traffic situation we encountered during the exodus on Tuesday afternoon. The trip back was remarkable easy. Wednesday evening we made phone calls to Savannah from the motel and found out from the Chatham Emergency Management Agency that we could get back into our home at 8 am the following morning. We decided to get a few hours of sleep and arise at 2 am Thursday (today) and get on the road hoping we would not repeat the previous driving experience. While driving back traffic did come to a full stop about 115 miles from Savannah, but it turned out to be merely an intersection bottleneck and we were again moving in about 5 minutes. We kept moving all the rest of the way in with only minor slowdowns and delays, mainly keeping our speed at around 50 to 55 mph. Once inside Savannah traffic was light all the way through town and traffic lights were working proving that power had been restored to most of the area. When we pulled into our subdivision we saw about the same wreckage as was revealed through town, only minor brush debris and not one tree down. (Well, one huge tree was blown over leaning on the back of one house causing some damage as I found by walking around later that evening.) Turning our corner we saw that our house was completely spared! No flooding, no branches through windows, no fallen trees! Even the two tall live oak trees that stand five feet from one bedroom window were still intact. And power had been restored (we knew it had been out because when we called home the phone worked but the answering machine did not). We thanked God immediately and profusely! Our wildest hopes were realized beyond all expectation, especially after seeing the devastation wreaked by Floyd in South Carolina and to the north. Not hearing any news of our area from the Weather Channel near Chattanooga we had no idea what to expect, though our hopes were raised seeing that the storm started tracking away from the Savannah area. It was just too good to be true. We are grateful for all of the prayers of our family members, some of whom we called while in the motel to give them some updates and let them know we were safe. So many others on the Eastern Seaboard were not so blest. Well, we both go back to work tomorrow. Bill will come back to stay and visit a little while longer after he truly makes a vacation out of this experience and drives south to explore some of northern Florida. But for us it is over and we are extremely grateful.